When Samantha was first admitted to GHKL due to her 2nd episode of vomiting and that was her 3rd admission since birth. That was when she started to feed via a feeding tube. We were asked to purchase the feeding machine as both Darling and myself are working in private sector and we do not fall into the low income group. Otherwise we could request for a loan unit from the hospital. 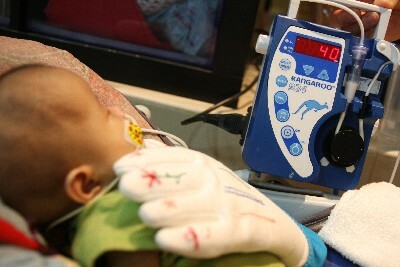 The cost of the feeding machine is about RM2k+ to RM4k+. As we had spent quite a large sum during Samantha’s 1st and 2nd admission in Prince Court Medical Centre, we were quite reluctant to purchase the feeding machine and was requesting if the hospital can give us a loan unit. On the other hand, we were also thinking that Samantha only requires it for short term. We then appealed for a subsidy through GHKL’s Medical Social Work Dept. While waiting for the appeal which will take quite some time, I then searched the internet for medical equipment suppliers if they have feeding machine on loan. At the end, Hospis Malaysia came into my mind. I called them and my inquiry was transferred to a pharmacist by the name of Aidah. Unfortunately they do not have any feeding machine or pediatric medical equipment. About 1+ hour later, I received a call from Aidah. She brought me a good news. She said she then remembered there was an unit of feeding machine at the store from a patient who had passed on. It is still quite new. She said I could loan it for free until if any of their patients needed it. What surprises me the most was that, how on earth she got my number. I did not leave my contact no. but I did tell her that I have a baby who is admitted to GHKL and requires a feeding machine. She actually made the effort to call up the Pediatric Unit of GHKL and managed to get hold of my no. So kind of her! God is great, isn’t it? Amen! Two weeks after Samantha’s passing, I called up Aidah and informed her that I am returning the feeding machine. That was then Aidah got to know that Samantha had passed on. We took the opportunity to give a token of appreciation to Hospis Malaysia. One month later, neither did I expect, instead of receiving just the receipt, it was accompanied with a PERSONALISED letter of appreciation. We were so touched with their thoughtfulness. They do not know Samantha nor seen her in person but through the letter, I can feel their compassion and care towards not just the patients but also their family. Tears rolled down my eyes whenever I got to know there are kind souls who love our dear Samantha and care for us. This entry was posted on Sunday, January 2nd, 2011 at 9:51 pm and is filed under Lessons, Motivation, Samantha. You can follow any responses to this entry through the RSS 2.0 feed. You can leave a response, or trackback from your own site. Very thoughtful of you too, to help others when you are in pain yourself. May God bless you and your family in this new year. Happy new year, Kimmy, Julie & Jonathan. I feel so touching while reading your post……Such a nice person…. It’s really very nice of this Aidah person to go extra miles to actually response to your request…and I, too applaud her for that. Please do continue to share your stories. It keeps Samantha’s memory alive. My aunt was a pioneer at Hospis so it is really encouraging to read positive news about them here. Thank you! God bless you, Kimmy and family for 2011! that’s the most touching story I’ve read in a long time. thanks for sharing this Julie . Thanks for sharing. Indeed a true testimony that God works in mysterious ways. And that He uses anyone He can. God bless you Julie and Kimmy. Samantha is a great testimony of God’s love. Hospis Malaysia has always been great in lending help for those terminally ill especially. When my aunt was diagnosed with lung cancer in 2005, Hospis Malaysi lend her the bed, the oxygen and etc so that she could stay at home and not at the hospital since it’s also costly and inconvenient at times. They also visited my aunt if I’m not mistaken every week to see how she’s doing. 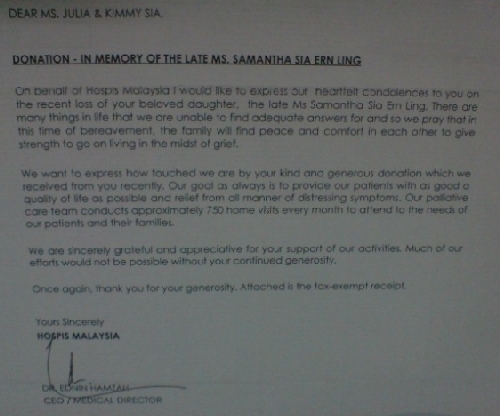 When my aunt passed away, she also left in her will a token of appreciation for Hospis Malaysia. I truly feel that the staff at Hospis Malaysia should be given more recognition than what they’re getting and reading your post reminded me again of the angels that God sent during our times of trouble. Take care. In times of need, He sent an angel to help you out and blessed you with their kindness and love. Hi, my mom had stroke last night. She is in Miri. She lives on 5th flr walk up shoplot. Now I am totally lost. Doc wants to discharge her..saying she had one side stroke. she can’t speak not understand us. How do i get help. GOd pls help me. I myself is married and i’m staying in Petaling Jaya. Miri doesn’t have any nursing homes. And Hospis Miri doesn’t have anything to offer.